It's time to protect your skin from acne breakouts without clogging pores and creating new blackheads. This is not an impossible task. All you need is a lightweight moisturizer. You probably know by now how the cycle works. Let your skin get too dry, or too oily, and new pimples appear. Walking that fine line means using a non-comedogenic lotion or cream you can trust. We researched the top moisturizers for acne-prone skin and reviewed them here for you. These are the best at hydrating skin without causing unwanted reactions. But first, let’s quickly list a few tips on how to choose the best face cream or lotion for your skin. 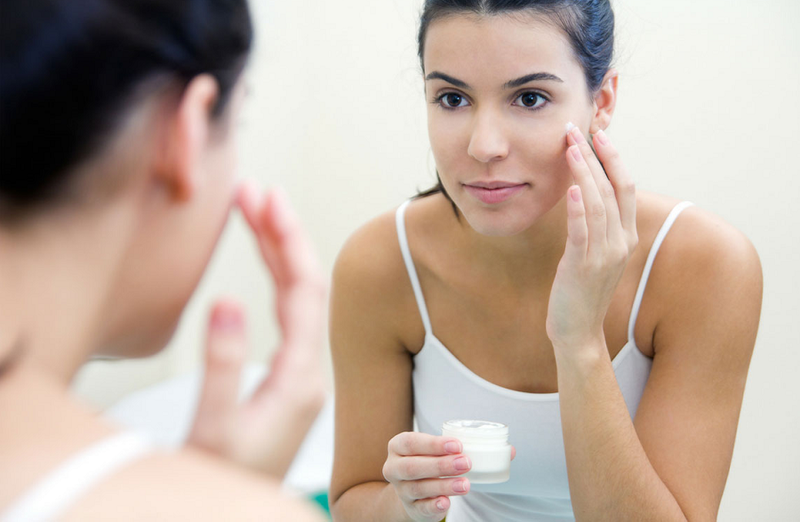 Although there are many similar products on the market, you can rely on a few key features when you’re shopping for moisturizers that are safe for your skin. Avoid ones with SD alcohol or denatured alcohol because they will dry out your skin in no time flat. Stay away from artificial fragrances and dyes. Don't buy oily creams no matter how dry your skin is--select lightweight products. You may want to choose to avoid most emollients like lanolin and shea butter. Emollients seal in hydration, but they can clog pores and leave a greasy residue. Aim for lotions, liquids, and gels for your face and leave creams for your hands and feet. Having acne-prone skin means you're at risk for adverse reactions every time you try a new makeup, moisturizer, or personal care product. Avoid flare-ups by testing new things on a small patch of skin and waiting for a day to see what happens. Sunscreen in your moisturizer is a smart idea for daytime wear. It protects you from sun damage which can dry out your skin and cause an outbreak. But be careful which ingredients your sunscreen uses. Some chemicals that block UV rays may cause skin irritation. Overall, the best moisturizers will feel lightweight on your face. Using them each day (and night) will keep your skin soft and looking healthy. Now let’s take a closer look at our picks of the the top moisturizers for acne-prone skin. With that said, let’s dive into our reviews of the top moisturizers. For those with sensitive, acne-prone skin, applying lotion just once a day may not be good enough. It’s weird, but not enough lotion can make your face oilier because your skin tries to compensate for lack of moisture. It’s better to keep things in balance day and night. EltaMD offers both AM and PM Therapy Facial Moisturizers so you can maintain your skin’s health all day and all night long. They are designed to protect super-sensitive skin. Customers who use EltaMD’s AM Therapy Facial Moisturizer say it feels creamy but it’s lightweight. The formula absorbs quickly and doesn’t feel greasy. EltaMD says this product was made to relieve skin problems caused by sunburn, acne medications, diabetes, and kidney disease. It works up to 12 hours, keeping skin hydrated and soothing irritated spots and redness. The PM Therapy Moisturizer uses the power of rice protein peptides to encourage collagen growth while you sleep. Niacinamide and antioxidants help your skin repair during the night. Neither the AM nor the PM formulas contain parabens that can disrupt your endocrine system. EltaMD’s UV Clear softens and hydrates acne-prone skin without parabens or perfumes. It contains both hyaluronic acid and Vitamin E to immediately moisturize your skin. Niacinamide, or Vitamin B3, soothes away redness so your skin doesn’t look irritated. This is useful if you’re taking acne medications. UV Clear is also a SPF 46 sunscreen based on all-natural zinc oxide. That’s healthier for you than chemical sun-blocking ingredients. Although the lotion looks white right out of the bottle, it turns transparent on skin. You can wear makeup on top of UV Clear with no problem at all. Vichy’s Normaderm Beautifying Anti-Acne Moisturizer for Oily Skin contains 1.5% salicylic acid to clear up pores and pimples. (This may cause a reaction if you are allergic to aspirin.) It gently exfoliates dead cells to clear up and renew your skin. The glycerin in the formula helps your skin will soak moisture and feel softer. The fifteen essential minerals from Vichy’s thermal water (from French volcanoes!) nourish your skin. You can apply the moisturizer up to three times a day, although it stays effective for up to 24 hours. Avoid putting it around your eyes because it may sting. While it does not contain parabens, it does have denatured alcohol. The Eau Thermale Avène Cleanance Mat Emulsion’s main ingredient is water from natural hot springs that’s been combined with zinc gluconate and monolaurin. The zinc reduces redness and irritation while monolaurin slows down oil production. Avène’s formula does not contain parabens or ingredients that clog pores. Some users say they see a noticeable reduction in their pores and blackheads and fewer acne breakouts. Cetaphil appears to be a favorite brand of dermatologists recommended to their patients. Their Dermacontrol Moisturizer won 5 different awards since it launched in 2012. Many users comment that Dermacontrol reduces oil on their skin but it makes their skin feel softer. It’s gentle enough to be used while you’re also using prescription acne medications. As you know, acne medication can dry out and redden skin, so this lotion works to counteract those side effects. It has a light texture, but it takes a little while to absorb into the skin. It has no fragrance and contains no parabens. Glycerin is one of its main ingredients, and that’s a very safe humectant for sensitive skin. Dermacontrol is recommended by the Skin Cancer Foundation as a sunscreen because it has SPF 30 protection against both UVA and UVB rays. Bee Naturals markets their Best Oil Free Moisturizer to both men and women, and they say it’s especially good if you have acne you want to eliminate. It uses an extract of the plant Feverfew, also known as wild chamomile, to fight inflammation in skin. The ingredients list contains purified water, vegetable glycerin, witch hazel, honey, hyaluronic acid, aloe, Vitamins B3 and C, plus extracts of several herbs like Feverfew, watercress, sage, and burdock root, plus essential oils of tea tree and lavender. There are no parabens. Users say it has a very pleasant scent and tingles a little. Fans of the DDF Ultra-Lite Oil-Free Moisturizing Dew say a little of it goes a long way. It feels light and not greasy and sinks in fast. DDF says this product won Best Face Moisturizer for Oily Skin at the CEW Beauty Awards. The formula is based on glycerin’s power to bind water into skin for hydration that endures. It also includes extracts of grape seed and green tea, plus Vitamins A, B3, B5, C, and E. There are no oils, artificial fragrances, or dyes in this formula. Unfortunately, it does contain parabens. You may have heard of Murad. Their Anti-Aging Moisturizer with Broad Spectrum SPF30 contains ingredients that fight wrinkles and acne, making it a favorite product among adult users. Customers comment that it’s light and smooth and sinks into skin fast. It’s good at controlling oil but leaves skin satiny, not matte and dry. The ingredients list is quite long and contains highlights like willow bark extract, Kombucha collagen defense, black tea extract, Vitamin E, and tea tree oil. There are no parabens, but the sunscreen is based on chemicals like avobenzone, homosalate, octinoxate, and octisalate. Some users have noticed that their wrinkles are fading and their pores are shrinking after using the Night Cream for a few weeks. And although it’s a “cream,” it’s lightweight and doesn’t leave an oily residue on skin. The Lavo Daily Moisturizer Cream works for any skin type, especially acne-prone skin, because it calms inflammation and protects pores against bacteria and pollutants. It’s fragrance-free and paraben-free, and never tested on animals. The ingredients list includes hyaluronic acid, hops, sage, ginseng, rosemary, allantoin, aloe vera, azulene, wheat germ, hazelnut, safflower and avocado oils, and Vitamin A, B, C, and D. Lavo explains that all these natural components add moisture to skin, soothe and tone it, and shrink pores. It absorbs quickly and leaves a matte finish for wearing under makeup. You can apply it both day and night. For an even lighter-weight moisturizer, try this gel from Simple. It doesn’t contain oils, perfumes, or parabens. Instead, it’s built on glycerin and Vitamins B5 and E.
Users say it’s very light on their skin, it doesn’t feel oily at all, and it doesn’t doesn’t cause breakouts or irritation. Baxter of California’s Oil-Free Moisturizer’s formula helps men’s faces heal faster from acne breakouts and nicks from shaving. It contains aloe vera, chamomile, and green tea extracts, but it’s fragrance-free. A small amount goes a long way, and it absorbs quickly into skin. Some users say they switched to this moisturizer from other brands made for men because it’s better for their sensitive skin. If you wear LilyAna’s Naturals Retinol Cream Moisturizer outdoors, please wear sunscreen, too. Skin care products with Vitamin A can increase skin damage from UV rays. With that said, Vitamin A in the form of retin or retinol is a powerful weapon in the fight against acne, age spots, uneven skin color, and scars. The formula of this product is based on aloe, plus it contains Vitamin E, hyaluronic acid, green tea, shea butter, and jojoba oil. There are no artificial dyes or scents, no parabens, and it wasn’t tested on animals. You can apply it both day and night for best results. We hope you found the perfect moisturizer today. You can cut down on redness, dryness, and breakouts with a little loving care each day and a little pampering each night. Pro tips for acne sufferers: Wash your face with a gentle cleanser in the morning and at night before bed. Take that makeup off to avoid unwanted pimples. Exfoliate gently once or twice a week. Also, wash your hands before applying medications or moisturizers. Check back soon for more reviews of the newest and best in skin care and beauty products.